Feature a collection of favorite children's books displayed beautifully in the nursery or your child's room with the Amish Oak Wood Bookends with Wooden Train to support them on either end. For kids who love to read and collect books, place a set of handcrafted bookends on each of their treasured bookshelves! These Amish made beauties are made of oak wood which is a strong and light colored hardwood that emits a sense of warmth in any room. Carved by Amish woodworkers with years of experience, these solid wood bookends feature a wooden train that adds to the decor of the room. 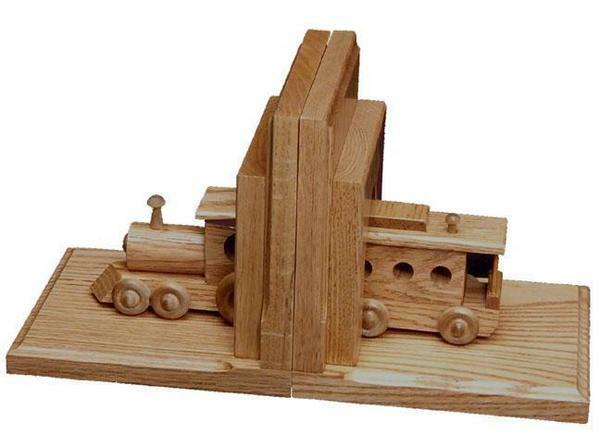 Explore our collection of Amish Made Wooden Toys to allow your children and grandchildren to experience toys that spark the imagination. Call us today with any questions, toll-free at 866-272-6773. 7" x 6.5" x 7.25"